Vampires Vs Unicorns: Floor War was a successfully funded game on Kickstarter in April 2017. With unique and strange art by Travis Louie and Travis Lampe this game is sure to peek your interest. If you missed the unboxing check out the video below. Each player sets up their Floor Tiles as seen in the photos below (I think the tiles are actually supposed to be touching - Oops). There should be a distance of four tiles between the two pyramid setups but you can make adjustments to increase or decrease the difficulty. 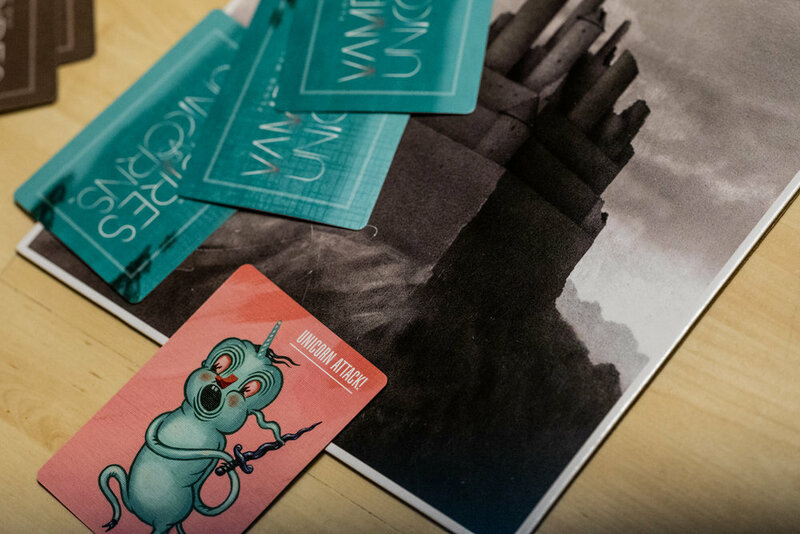 Each player then takes either the vampire deck or the unicorn deck and stands behind the corresponding castle. Level 1: These four floor tiles are the ones farthest away from your castle. If an opponent's card lands on top of one of these tiles, even partially, the tile is removed from the game. Level 2: These are the two tiles closest to your castle. These tiles take two hits to remove. If an opponent's card lands on top of one of these tiles, even partially, the tile is then flipped to it's opposite side and considered damaged. As soon as another card lands, even partially, on the damaged tile, it is removed from the game. Castle: Your castle can only be removed from the game if a card lands completely on top of it, not protruding from any of the edges. Alternatively, if all of your other tiles have been removed, your castle is no longer protected and is flipped to it's opposite side. When this happens it is treated as a level 1 tile. When a player successfully removes their opponents castle, they win the game. If a player runs out of cards in their deck, they automatically lose the game. Right off the bat I can tell you that I LOVE the art for this game. Instead of choosing one individual artist to illustrate the game, they took it one step farther by choosing the best possible artist to illustrate the vampires and the best possible artist to illustrate the unicorns. 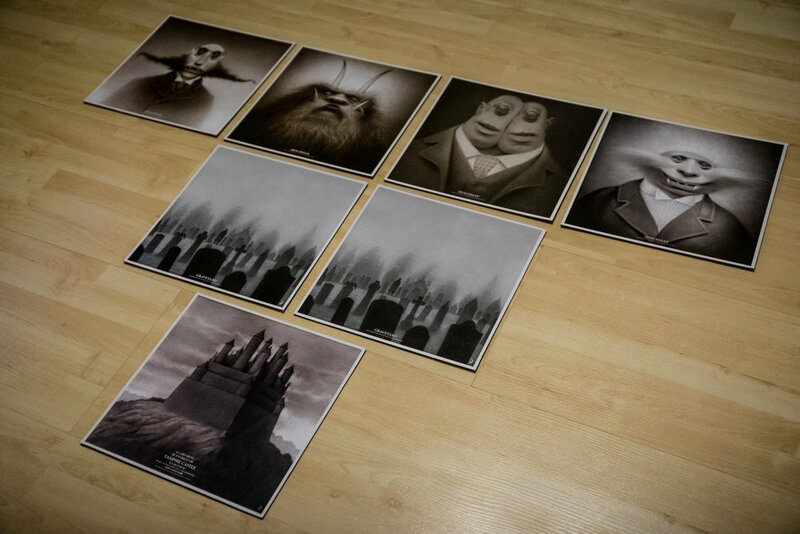 The art is really out there and so peculiar, it makes it really hard to not enjoy it. I can confidently say that the rule book for Vampires Vs Unicorns is the first that I have ever enjoyed reading almost as much as playing the game. It's full of humor and at one point, while reading the FAQ, I actually laughed out loud. I was so amused I ended up sending a photo of the rule book to a couple of my friends. The overall quality of the components has a little bit to be desired. When I went outside with the box, the few snowflakes that landed on the box caused some minor watermarks. With repeat use, the cards do get a little worn making the game more challenging to play. I considered sleeving the cards but I wasn't sure if that would make it easier or more challenging to play. It's probably an option worth exploring if you decide to add the game to your collection. I enjoyed that the unicorns and vampires had different card abilities. The unicorn player frequently gets to throw multiple cards at the same time and/or steal cards from the vampire deck which could make the vampire player run out of cards sooner. The vampire deck however is counterbalanced quite well by being able to throw used cards from the floor or to continue throwing cards until they are unsuccessful. I feel like both decks are extremely well balanced. I played this game on our living room floor but it was a tight fit. Since this game is played on the floor, you need a fair amount of space to play it comfortably. I really feel like this game would do best in a party or convention type setting and that a bigger audience would certainly add more enthusiasm to the game. I would love see this game used at a convention in a tournament format and I think it would be quite easy to do so. In my opinion somewhere with a big audience is where this game will be the most appreciated. I have left my particular copy at Offline Board Game Cafe where I thought it could get more use. If you're one of my local readers, stop by the cafe with some friends and try it out for yourself. Post your photos online, and give your feedback in the comment section below. I'd love to know what you think. Looking to pick up this game for yourself? Order a copy Here.